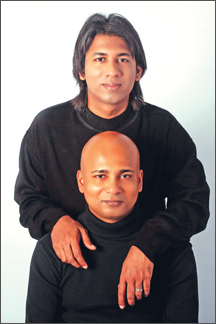 Rohan and Ishan De Lanerolle, teaming up a single singing act, launched the De Lanerolle Brothers Logo on February 10 at a media briefing conducted by Leo Burnett Solutions Inc. in Colombo 3. The blend when you sing together is great, was the trend of comments from listeners which cemented their branding together, Ishan added. The launch concert, a dinner event, will be held at Water’s Edge on March 3, said Haadia Galely, the duo’s Manager. In July, a concert with a British pianist and in September, a song-dance-acting performance is planned. “We want to integrate musicians from all over the world to support the De Lanerolle Brothers,” said Galely. We are integrating cultures. Rohan and Ishan will have some performances overseas, one of which is expected to be on a cruise liner. They are also expected to support other local artistes to get on to an international platform through them. Tours in Singapore, Malaysia and the Maldives and own concerts of the brothers throughout 2010 is being scheduled. The ‘high baritone’ Rohan, the older of the brothers, is well known here and overseas as a singer/vocal trainer. He has sung in international concert halls including Weill Recital Hall, Carnegie Hall-New York, The Sheldonian Theatre-Oxford and the Adrian Boult Hall-Birmingham and performed in Los Angeles, Australia, Singapore and the Maldives. He has collaborated with internationally acclaimed pianists such as Rohan De Silva-USA, Dr. Jonathan Clarke-UK, Dilanthi Fernando-USA and UK and Soundarie David-Sri Lanka. Rohan recorded several albums with the Sri Lankan pianist Ramya De Livera Perera and appeared with the Christ Church Festival Orchestra conducted under the baton of Dr. James Ross and the Philharmonic Orchestra of Sri Lanka conducted by the late Rohan Joseph De Saram and the Symphony Orchestra of Sri Lanka. Ishan the ‘Bass’ singer is the President/ Partner/ Director of the Revelations Academy of Performing Arts & Creativity which teaches about 100 children to sing, act and draw. Revelations as a Male Voice Choral Ensemble is ranked sixth in the world to which both brothers have contributed. Ishan has directed many choirs in Sri Lanka. While at St. Thomas’ College, Ishan won the trophies of ‘the Best Bass Singer’ and ‘the Best Actor’. The Thomian Chamber Orchestra was his brainchild and he was invited to be its first conductor and leader. He initiated the first Inter School Music quiz for college through the ‘Classical Music Association’ of which he was the President. 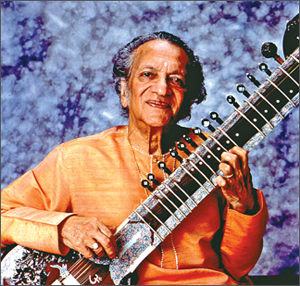 Sitar legend Ravi Shankar’s new East Meets West music label will be a stage for his philosophy of exploration, experimentation and cross-pollination The Ravi Shankar Foundation launches East Meets West Music (EMWMusic) this month to bridge the divide between his recorded music and his global audience. Shankar, a legendary sitarist and composer who pioneered India’s classical music fusion with Western culture, has an astonishing archive of thousands of hours of live performance audio, film footage, interviews, and hopes to provide a glimpse into what has most inspired and shaped him in his 70-odd years on stage. “There is something beautiful about the stage. There is a performer and there is an audience. Nothing is in the way. “The sound remains pure and unburdened by things like marketing and distribution. “My hope is for this label to be more like a stage and less like the music business as I have experienced it,” says Shankar. The label’s debut release is ‘Nine Decades: Volume One,’ scheduled for his 90th birthday on April 7 2010. In the fall, EMWMusic will release the George Harrison produced documentary on Ravi, called ‘Raga’ along with the soundtrack to the film. K.C. 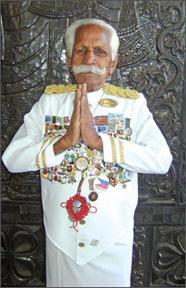 Kuttan, still battling strong in his year 90 could well be the longest, serving hotel employee in Sri Lanka perhaps in the world. “Happy Birthday Kuttan”. He will be celebrating his 90th Birthday on February 15, at the Galle Face Hotel. Despite his Korale Mahaththya looks, soft voiced Kuttan was not born here in Sri Lanka. He fled his home in Kerala, India at the tender age of 19 years after his mother died, without telling his two brothers and three sisters and arrived by sea at Talaimannar in the pre-independence year of 1938. The same year he found work at the Galle Face Hotel. My Salary was 20 rupees a month. The hotel and Kuttan grew together, experiencing visits of many dignitaries such as Lord Mountbatten, Princess Elizabeth, Pandit Nehru and Aurther C Clarke. Valentines is a time for love to set sail into your heart in different ways. At the Galle Face Hotel, Sri Lanka’s Heritage in Hospitality every Dining area will be brought alive by melodies of Love and Romance. Love is in the air! The Verandah Restaurant will offer a exclusive High Tea Buffet with a High Fashion show on February 13th from 4 pm to 6 pm. Also an extravagant Dessert Buffet will come a live for all legendry lovers at the 1864, Fine Dining Restaurant from 11 pm to 1 am on the 13th February. Come and enjoy lavish desserts and desserts at the 1864 with your loved ones. Valentines Day is meant not only for lovers but for friends and family too. The Verandah Restaurant will host a grand Valentine Family Brunch on February 14th from 11 am to 3 pm with live entertainment and a kiddies corner with bouncers, movies and face painting will be offered for all guests and kids who dine at the Verandah on Valentines Day. If you feel like heading into a totally new experience, step into the 1864, Fine dining Restaurant on Valentines Day. The exclusive surroundings of this Restaurant will be decorated in hues of silver and red. A candle lit 7 course dinner will be served with live romantic entertainment with Chocolates, Red Roses and Cocktails. The Verandah Restaurant and the Patio Garden area will also offer a grand Valentines 5 course dinner. The Venue is legendry to lovers, by the side of a spectacular view of the Indian Ocean. The dinner will be on from 7 pm to 10 pm on February 14. The Sea Spray Restaurant overlooking the Indian Ocean will offer a spread of culinary delights ranging from the best of Seafood to the finest cuts of meat prepared just for the two of you. Enjoy the moment with your loved one this Valentines Day at the most romantic venue of the Galle Face Hotel. Financial Accountant Sumith Wijesinghe accepting the award on behalf of Cinnamon Lakeside Colombo from CMC Chief City Administrator Omar Kamil. Cinnamon Lakeside Colombo was recently felicitated with a ‘Most Honoured Citizen’ award for 2010 by the Colombo Municipal Council (CMC), in recognition of the valuable contribution it has made towards city development by making payment of Municipal rates and taxes on time and without arrears during the past five years. The award was given by the CMC Chief City Administrator, Omar Kamil. 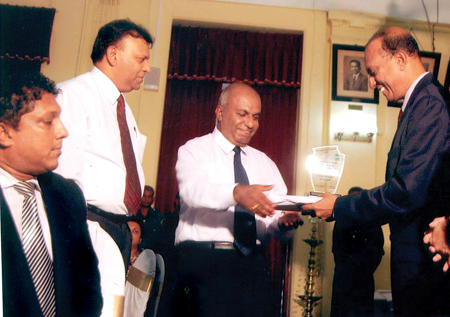 Cinnamon Lakeside Colombo was among the 100 recipients of this award. The ceremony also witnessed the launch of the ‘Honoured Citizen’ card, designed to reward loyal, timely, tax-paying citizens with certain benefits. These include free parking on approved parking lots of the CMC, permission to park the vehicle within the Town Hall premises, special counters for tax/rates payments, priority at all Municipal services, special recognition at all Municipal offices, pest control services, special care at the customer care counter at Town Hall, opportunity to hoist the National Flag at Town Hall on the first day of the month and priority at the Municipal poly clinic at Slave Island (Colombo 2). The card is valid for one year. It began with a single performance of Madama Butterfly, half a century ago, in the McKinley High School auditorium. Since that debut, Hawaii Opera Theatre (HOT) has grown into one of the nation’s leading opera companies, and offers a full Grand Opera featuring nine main stage performances per season at the Neal Blaisdell Concert Hall. While the setting of HOT’s inception may have been modest–especially in contrast to the long, velvet curtains and rich red carpet inside the Blaisdell Concert Hall–insiders say local opera was a hit from the start. Opera, local-style First and foremost, the success of local opera is about musical performances infused with the character of those who live in–and share a love for–Hawaii. That first performance at McKinley may have marked the beginning of HOT, but the people of Hawaii had for a century already embraced the art form. 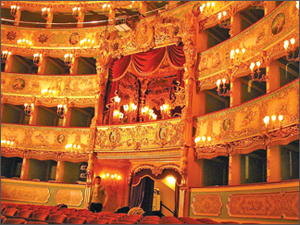 Opera began in 16th-century Italy as an exploration of Greek drama, and found its way to the Islands in the 1850s. When HOT was founded, it was as a subdivision of the Honolulu Symphony. “The conductor of the Honolulu Symphony wanted to do opera in Honolulu,” says Akina. “He began planning how to do it as musical director of the orchestra, and invited the Canadian stage director Irving Guttman and an international cast to join him in this effort.” Collaboration with the operatic world outside of Hawaii has been an essential component of HOT’s development. Akina, a Hawaii native who has directed opera companies in Germany, Hungary, France, China, Thailand, the U.S. mainland and Canada, said Hawaii’s remote location presents a slew of challenges for an industry that is simply not wholly sustainable on a local level. “On the US mainland and in Europe for instance, there are many more resources closer to other opera companies,” he said. “Like everything else in Hawaii, opera is dependent on communication with the outside world. I sometimes think that our future is absolutely dependant on how we create valuable relationships between Hawaii and the outside world. I would venture to say that that is only true of opera for our state.” Despite challenges, HOT has long since found ways to thrive. Opera o na kanaka Honolulu’s devoted audience is not the homogeneous demographic that many assume it is. “At a point early on in opera history, it was for the elite,” says Erik Haines, director of education and outreach at HOT. “Eventually, it became an art form of and for the middle class. You’ll find people from all walks of life attending the opera today.” Part of that, opera scholars say, has to do with barriers to entry–like foreign language, for example–that have been removed. “The full house at Blaisdell this afternoon was laughing and thoroughly enjoying Mozart’s Le Nozze Di Figaro [performed in Italian],” says Lesley Wright, professor of musicology at UH-Manoa. “The excellent acting and singing of the cast [was] supported by well-chosen supertitles that translated the text.” Others say that even if an audience can’t understand what is being said (or sung), the essence of the opera’s story still comes through. The next 50 In celebrating its golden anniversary, HOT leaders find themselves looking ahead to the next 50 years. Akina, who was only 5 years old when HOT began, says he hopes to continue challenging audiences with new and exciting work. Today, HOT audiences can be found wearing sandals and shorts, suits and tuxes, or pearls and formal gowns. In addition to upcoming regular performances, like Wagner’s Die Walküre and Puccini’s La Bohème, HOT also presents “Opera for Everyone” night, where students have the opportunity to watch an exclusive presentation of the final, full-dress rehearsal for a discount.